WILL THESE BIOPICS WORK BIG TIME AT THE BOX OFFICE? MANIKARNIKA – THE QUEEN OF JHANSI: This is a biopic of Rani Lakshmibai, the brave warrior from Jhansi and also a national hero. Kangana Ranaut plays the titular role of the brave queen. The other actors in the film are Jisshu Sengupta, Mohd Zeeshan Ayyub, Ankita Lokhande, Atul Kulkarni, Danny Denzongpa, Mishti, Taher Shabbir, Kulbhushan Kharbanda etc. The trailer is interesting and the film looks grand and something that can be enjoyed on the big screen. Also, Kangana suits the role. A few viewers have issues with her dialogue delivery as they feel it doesn’t seem convincing. But overall, Kangana has managed to make a mark, at least from the trailers. Sadly, the film remained in news more for the wrong reasons than the right. The problems started even before the film went on floors. Kangana in 2015 was supposed to do this film with director Ketan Mehta. But she abandoned this film and collaborated with director Radha Krishna Jagarlamudi aka Krish. In second half of 2018, she developed problems with Krish as well. As per reports, Manikarnika – The Queen Of Jhansi didn’t shape up well and the producers decided to reshoot certain portions. Krish however refused to do the re-shoot as he was busy with two-part biopic of late actor-politician N T Rama Rao. As a result, Kangana took over the reins and publicly spoke ill about Krish. She also had a feud with Sonu Sood, who originally played the role of Sadashiv. Mohd Zeeshan Ayyub replaced Sonu after he walked out of the film and Kangana claimed he did so as he didn’t want to take orders from a female director! The trailer of Manikarnika – The Queen Of Jhansi got lot of attention but the promotion wasn’t great. Hence, the hype died down a bit. Songs also haven’t worked. Earlier, a Rs 10 crore opening seemed like a possibility but now the opening might be around Rs. 7-8 crore. Saturday January 26 is when the Republic Day falls and if response is positive, the collections can double. However, the film has to be really good in order to become a commercial hit. A lot has been spent on the film and the re-shoot further added to the expenses. As per the reports, the budget of the film is more than Rs. 100 crore. As a result, this high cost can be recovered only if response is extraordinary. 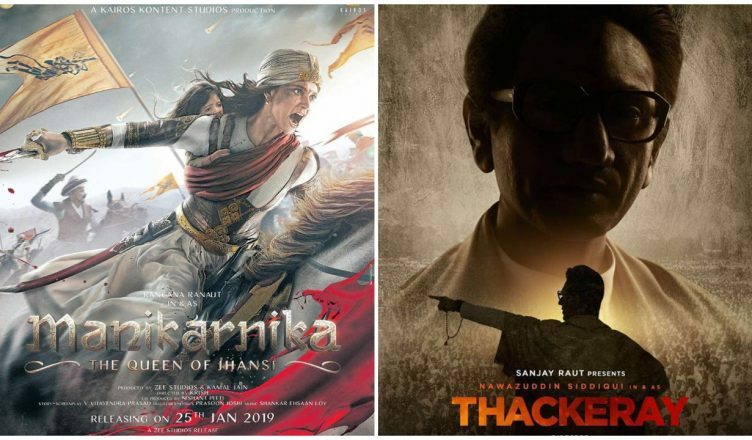 THACKERAY: As the name suggests, it’s a biopic of Shiv Sena founder Balasaheb Thackeray. He was one of the most inspirational figures of Maharashtra and even Indian politics and hence, his biopic has a chance to work. The film releases in both Hindi and Marathi and only the latter can succeed. The excitement for Thackeray outside Maharashtra is very less. As a result, both versions can do well mainly in Maharashtra. The Marathi version can run riot and emerge as a potential blockbuster. It’s business would be sufficient to cover costs. As for the Hindi version, it again can excel in Maharashtra and if all goes opening, the all-India opening of this version would be around Rs. 3-4 crore. If response is positive, then it might do slightly better from Day 2. Thankfully, the lead role is played by Nawazuddin Siddiqui and his presence has ensured that the film has a chance outside the home state as well.